Email has long been one of the most resilient tools in marketers toolkits, adapting to suite the ever expanding needs of professionals. Popular email services provider (ESP) Mailchimp has released its latest figures on how many messages it sends to major clients. Through analyzing more than 81 billion emails so far from 2015, the ESP deduced that Gmail use is up 70 percent in the last year while AOL and Comcast are up 31 percent. Another interesting finding is the difference in the amount of Gmail messages sent compared to the amount of emails to Hotmail accounts. When MailChimp performed a similar look at their numbers in July 2012, it found that Gmail accounts received more than 100 more emails than Hotmail users. However, when MailChimp looked at the numbers this July it found that the difference was closer to 1.8 billion emails. 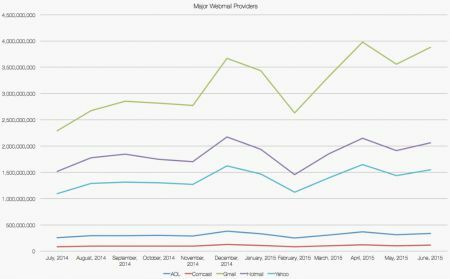 So far in 2015 the ESP has far and away sent the most messages to Gmail accounts followed by Hotmail and Yahoo with AOL and Comcast bringing up the rear.